This Hubble composite photo shows the two galaxies NGC 4522 (left) and NGC 4402(right), whose gas is being stripped out of them by winds in the Virgo Cluster to which they belong. A new set of images from the Hubble Space Telescope, takenbefore its recent overhaul by astronauts, has revealed strong winds rippingthrough a pair of galaxies, distorting their shape and halting star formation. The galaxies, members of the Virgo Cluster, are beingaffected by a process called "ram pressure stripping." As galaxies inthe cluster move through hot gas lurking in the gaps between them, winds causedby their swift motion tug and stretch them, resulting in peculiar-lookinggalaxies. Ram pressure is the drag force that results when somethingmoves through a fluid ? similar to the wind you feel in your face while ridinga bicycle. In the case of the Virgo cluster, the spiral galaxy NGC 4522- located about 60 million light-years from Earth - is a spectacular example ofa galaxy currently being strippedof its gas content. The galaxy's rapid motion within the Virgo Cluster resultsin strong winds across the galaxy as the gas within is left behind. Scientistsestimate that the galaxy is moving at more than 6 million mph (10 million kph).A number of newly-formed star clusters that developed in the stripped gas canbe seen in the Hubble image. The photo highlights the dramatic state of the galaxy, withan especially vivid view of the ghostly gas being forced out of it. Bright bluepockets of new star formation can be seen to the right and left of center. Theimage is sufficiently deep to show distant background galaxies. A Hubble snapshot of another galaxy called NGC 4402 alsohighlights some telltale signs of ram pressure stripping, such as the curved appearanceof the disk of gas and dust that results from the forces exerted by the heatedgas. Light emitted by the disk illuminates the swirling dust that is beingswept out by the gas. Studying ram pressure stripping helps astronomers betterunderstand the mechanisms that drive the evolution of galaxies, as well as howthe rate of star formation is suppressed in very dense regions of the universe. 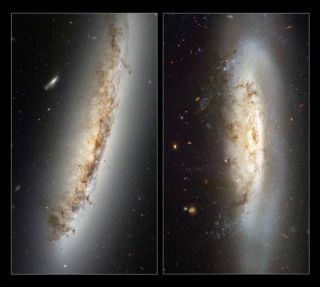 Both new images were taken by Hubble's Advanced Camera forSurveys (ACS) before it suffered from a power failure in 2007. In May,astronauts on the STS-125 mission of the space shuttle Atlantis visited Hubblefor the final time, overhauling its equipment, installing new instruments, andrestoring the ACS to service.